The time has come for Britain’s biggest companies to pay living wages, says guest blogger Matthew Butcher of FairPensions. The plight of people being paid starvation wages across the world has been rightly highlighted many times in the New Internationalist. While the extreme poverty suffered by workers in the developing world deserves our attention, there is also growing concern over workers here in the UK being paid poverty wages. At the beginning of this month, a group of investors with a combined wealth of over £13 billion joined forces with FairPensions and their union colleagues to ask Britain’s biggest listed companies to pay living wages to all of their on-site staff. The living wage, they suggested, brings benefits to both employees and employers and, according to the Prime Minister, is an idea ‘whose time has come’. 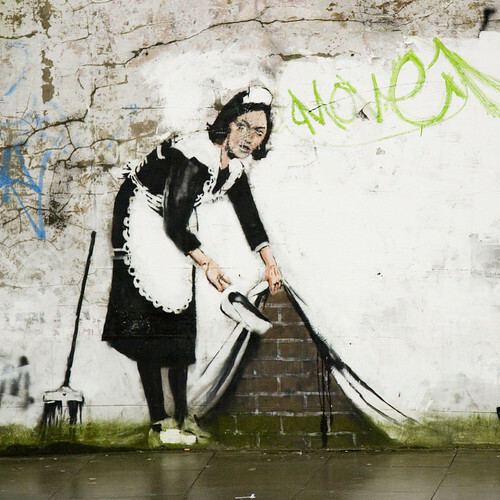 Banksy street cleaner, Chalk Farm. Photo by Dan Brady under a CC Licence. A living wage is the minimum hourly wage necessary for housing, food and other basic needs for an individual and their family. Within London, the Mayor’s Office announces the living wage figure each year – currently £8.30 (roughly $13.50) per hour. Outside London, the Centre for Research in Social Policy at Loughborough University has calculated a single rate for the regions outside of the capital which is £7.20 ($11.70) per hour. The National Minimum Wage, currently £5.93 ($9.65),on which many people survive, simply does not provide people with enough money for a decent quality of life. Across Britain there are over 3.5 million people over the age of 22 struggling on less than £7 an hour. With inflation running at 4 per cent and the increasing likelihood of public services being withdrawn, it is becoming ever more difficult for those on the lowest wages to remain solvent. At the very same time, Britain’s biggest companies are, for the most part, posting huge profits – running at times into billions of pounds –and continuing to pay their top-end staff hundreds of thousands of pounds per year at the very least. Low pay is particularly pernicious in its impact on children’s lives. In five years – between 2004 and 2009 – the number of poor children in a household with at least one worker grew by 25 per cent and, according to the most recent research, there are 2.2 million children growing up in poverty with at least one parent working. Less than 50 per cent of children in poverty grow up in ‘unemployed households’. The living wage does, as you would expect, have its critics. ‘This is no time to think of paying people more, it’s an age of austerity’ they say. The fact is, however, that corporate Britain paying its way could actually save the government money. Low wages are often ‘boosted up’ by government tax credits which are aimed at encouraging people to work even if the pay is low. If corporations, whose finances are often in better shape than the government’s, paid their workers a living wage then there would be more money in the public purse to spend on health, social care and job-centre staff, for example. Studies have also shown that people tend to spend their extra money in their local, often deprived, areas, thus boosting the economy as a whole. The time has come for Britain’s biggest companies to pay their way and ensure that all of their workers earn enough to enjoy a decent quality of life. FairPensions’ first Living Wage action is pressuring finance companies to become Living Wage employers. Anyone who has a financial product with a FTSE 100 company can take action – and that probably includes you! Activating the power of our organized money to call for living wages will literally change lives, lifting families out of working poverty. Sarah Edwards on why the new framework for international development could be a lost opportunity to tackle inequality.